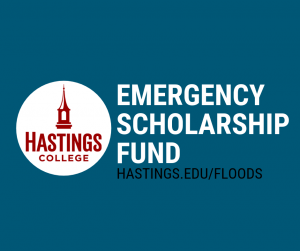 The Hastings College Foundation has established an emergency scholarship fund to support students who may be facing financial hardships due to recent unprecedented flooding and other natural disasters. Approximately 60 percent of Hastings College students are from a declared disaster area, and the Foundation recognizes that some families from Nebraska and other states may need assistance in the form of additional scholarship aid. In the weeks and months ahead, the emergency scholarship fund will be used as one-time scholarships to help families as they rebuild. Those who would like to support fund are encouraged to give online at hastings.edu/floods or mail a check to the Hastings College Foundation, 710 N. Turner Ave., Hastings, NE 68901. Checks can be made payable to the Hastings College Foundation and include “Emergency Scholarship Fund” on the memo line. Hastings College has also encouraged students who may be facing challenges to utilize counseling services on campus, to visit the Crimson Cupboard in case of food insecurity and to reach out to their academic advisor or Student Life team for additional support or questions.